use it for your own graphic. Tons of effects, High performance, Animation Editor included. Enliven ’em! – Animate SVG with Easy! If you are looking for a modern JS script which is based on HTML5 standards for animating your SVG (Scalable Vector Graphic), you came to a right place. The main purpose of the Enliven 'em! script is to let you "enliven" (animate) an each part (shape) of your illustrations in many different ways when your vector image become visible in a user's browser viewport. Animations can be also repeated. Try to "click" or "tap" the illustrations. Only two additional scripts in your page(s) for jQuery version and one already developed plugin for WordPress. All animation data are placed into SVG code itself. The Animation Editor, which is included in the download package, can help you to add these data in a WISIWYG mode. Please get familiar with all features list and explore the examples. The new SVG animation engine which lets you "enliven" (animate) any shape in many different ways. Script comes with more than 70 80 (from v1.3) build-in animation effects to choose from. Enliven 'em Animation Editor is also included. Easy to add, remove, change animation options in WYSIWYG mode. Vector parts (shapes) can have either "In" or "Out" animation with their own effect, delay, duration and easy. The main event for an animation starts is a "viewport". Also click (tap) event can be applied for repeating. Suitable for "non-hover" devices. No need to click or tap, animation starts when SVG becomes visible in a browser's viewport. jQuery plugin: simply upload two JS scripts and one CSS file. WordPress plugin: install as any other one. From v1.4 your animation can be repeated infinity. So you can use Emliven' em script as a specialized SVG slider! Enliven 'em currently works in Firefox, Safari, Chrome, Internet Explorer 9+, iOS and Android. 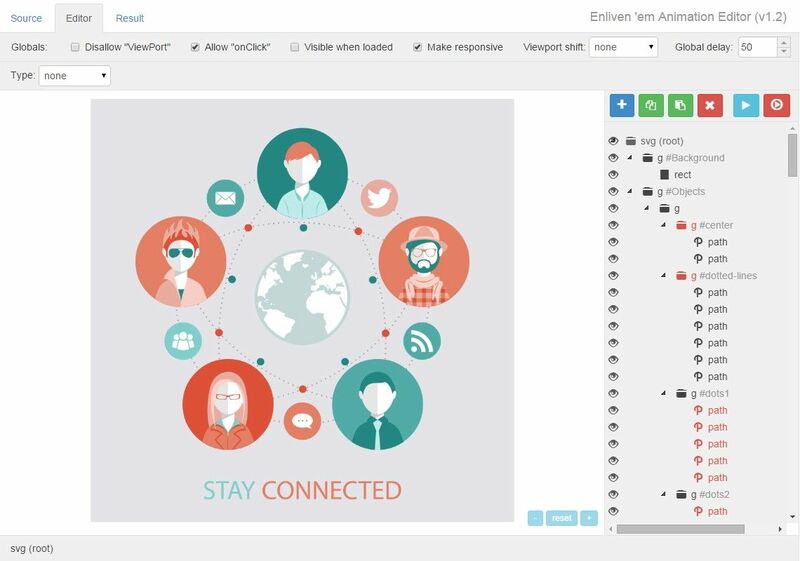 Enliven' em is a script for vector graphic, which is presented perfect on high-resolution devices. Make your SVG image responsive with checking just one option. This effect lets you transform any path shape as though it flows from one form into another. This effect allows you to control all transformations (translate, scale, rotate, matrix) and opacity of any SVG shape. Here is the definitely when the only limit is your imagination! Click the icons for some examples and please remember that "the only limit is your imagination"
The main: Each SVG shape (groups, rectangles, circles, paths, polygons, etc.) can have its own animation parameters, like effect, delay, duration and ease. This is achieved by adding a special class name to these shapes and desired value to one HTML5 data attribute. Sounds hard to do maybe, but the Animation Editor is extremely helpful to do this task in a WYSIWYG mode. Note 1: You must have defined width and height and/or viewBox attributes in <svg> tag. Note 2: The script works only with pixel units. You can't use em, %, etc., only px. Think of your SVG illustration like any other image which has its own width and height. Upload and install the WordPress plugin as any other one. Additional to your jQuery, upload two JS scripts and one CSS file to your server and define them in your HTML code. Upload ready to use SVG file of your vector illustration to your server. Define this file in a desired place as a source for <img> tag. Add class enlivenem to your <img>. On this video you can get familiar of the preparing process of an animation of your SVG illustrations. Please get familiar before purchase with the Documentation and try to make your own animation with the Enliven' em Animation Editor. Also please don't forget to check these ready to use Premium and Free Add-ons. Very interesting plugin. I thoroughly look forward to seeing where it goes. Great job on the development. The Best Part of the project is the Editor which you have made. It's the easiest part for making the animation. Really amazing toolkit. Great work!!! Excellent editor but you are selling this product far too cheap. It is worth many times $10 :) Looks like code canyon users will be a getting a great deal. ...Thank you so much for Enliven ‘em. It’s a massive time saver and a joy to use. Yes, this script comes in two ways: a WordPress plugin and a standalone jQuery plugin. Just two (2) libs: jQuery and Snap.svg by Dmitry Baranovskiy. Yes, of course. After purchasing you can contact me via email contact form on an item's support tab on CodeCanyon. Please Keep in mind that my free support does not include any customization or integration with third party scripts (plugins). Can I use your products in multiple websites with one license? Do you give a permission to resell your Enliven 'em products with my own product (Template, WordPress Theme, etc.)? Ready to Enliven Your Graphic? The price is fair. Guaranteed.